St. Maron (ca 345-410; his name also written St. Maroun) was from the ancient area of Cyrrhus (Cyrus) in what is now southern Turkey, not far from the Syrian city of Aleppo. He lived the life of an ascetic, at a hill top where an ancient temple to the Babylonian god Nabo stood, which he converted to a Christian church. His hermit lifestyle was characterized as living “in the open air.” Where he resided, the summers were very hot and the winters very cold, but he was willing to be exposed to these extremes in order to focus on his spiritual goals and overcome concerns for his body. 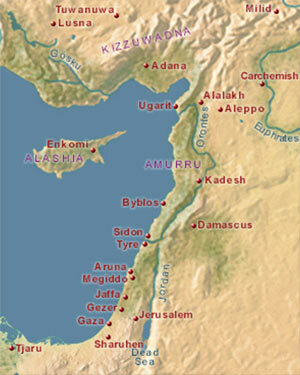 The Christian tradition of the area where he lived dates back to St. Peter, who established a church in Antioch and visited there several times, approximately during the period 35-55 A.D., before moving on to Rome, where he was martyred around 67 A.D.
After him [Acepsimas] I shall recall Maron, for he too adorned the godly choir of the saints. Embracing the open-air life, he repaired to a hill-top formerly honored by the impious. Consecrating to God the precinct of demons on it, he lived there, pitching a small tent which he seldom used. He practiced not only the usual labors, but devised others as well, heaping up the wealth of philosophy. The Umpire measured out grace according to his labors: so the magnificent one gave in abundance the gift of healing, with the result that his fame circulated everywhere, attracted everyone from every side and taught by experience the truth of the report. One could see fevers quenched by the dew of his blessing, shivering quieted, demons put to flight, and varied diseases of every kind cured by a single remedy; the progeny of physicians apply to each disease the appropriate remedy, but the prayer of the saint is a common antidote for every distress. He cured not only infirmities of the body, but applied suitable treatment to souls as well, healing this man’s greed and that man’s anger, to this man supplying teaching in self-control and to that providing lessons in justice, correcting this man’s intemperance and shaking up another man’s sloth. Applying this mode of cultivation, he produced many plants of philosophy, and it was he who planted for God the garden that now flourishes in the region of Cyrrhus. A product of his planting was the great James [known now as St. James of Cyrrhestica], to whom one could reasonably apply the prophetic utterance, ‘the righteous man will flower as the palm tree, and be multiplied like the cedar of Lebanon’, [Psalm 92:12] and also all the others whom, with God’s help, I shall recall individually…. In Theodoret’s description, one of the specific conditions mentioned as being alleviated by St. Maron was ‘shivering,’ for which he retained a strong reputation even after his death. Thus, St. Maron has long been known as the saint to appeal to in cases of disorders involving trembling and shaking, such as Parkinson’s disease. We are bound to you by love and interior disposition, and see you here before us as if you were actually present. For such are the eyes of love; their vision is neither interrupted by distance nor dimmed by time. We wished to write more frequently to your reverence, but since this is not easy on account of the difficulty of the road and the problems to which travelers are subject, whenever opportunity allows we address ourselves to your honor and assure you that we hold you constantly in our mind and carry you about in our soul wherever we may be. And take care yourself that you write to us as often as you can, telling us how you are, so that although separated physically we might be cheered by learning constantly about your health and receive much consolation as we sit in solitude. For it brings us no small joy to hear about your health. And above all please pray for us. Chrysostom was in Antioch, about a two days journey from Maron’s residence, and the difficulty of the road mentioned in his letter revealed the dangerous travel at the time. Concerns for Maron’s health probably reflected his old age at the time this was written (around 405 A.D.), while Maron continued to live in the often severe environment. St. Maron became so popular that his numerous followers were known as Maronites. After his death, a Maronite monastery (Beth-Maroun) was built around 452 near Saint Maron’s tomb; Theodoret also described the profound devotion which the monks of the monastery had to their departed spiritual father. The monastery engendered a larger community where men and women, under the guidance of the monks, could find material and spiritual happiness. The monastery, situated not far from Mount Lebanon, belonged to the patriarchy of the Church of Antioch. As the hardships of the early Christian church continued, the faithful set their hopes on the Maronite community where, in spite of persecutions and devastating wars, the spiritual leaders provided guidance and protection. For centuries the spiritual leaders of the Maronites have kept watch over the political and social rights of their people. The Maronite movement reached Lebanon during its earliest days when St. Maron’s first disciple, Abraham of Cyrrhus, moved there to evangelize; he became known as the Apostle of Lebanon. For the past few centuries, the center of Maronite life has been in Lebanon (it is pointed out that the town of Cana, where the famous wedding feast took place with Mary, Jesus, and his new disciples in attendance, is in southern Lebanon). Today, there are Maronites in most countries, and they number more than 4 million. The liturgical rite of St. Chrysostom, which has been utilized in the Eastern churches (some rely on the rite of St. Basil), is adapted for the Maronite rite, one of 22 rites of the Catholic Church. 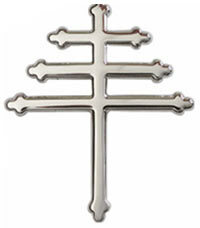 A unique cross was developed to represent the Marionite faith, one which gives tribute to the Holy Trinity by having three crossbars representing Father, Son, and Holy Spirit. 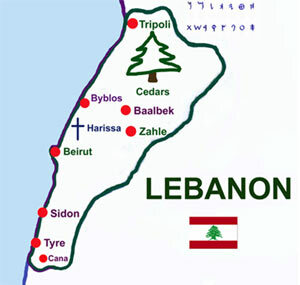 There is also frequent reference in Marion tradition to the cedars of Lebanon (Cedrus libani), mentioned several times in the bible; these cedars make-up a large forest in northern Lebanon near the area where St. Maron lived. 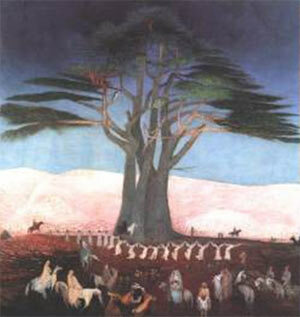 The cross has an appearance like these cedars (dramatically presented in the painting below from 1907); in fact, sometimes the three-bar cross is drawn as a cedar. There were many people inspired by Maron, who led lives imitating his, living as hermits and avoiding any comforts; others lived in an isolated monastic setting. Monastic life in the Maronite community was formally organized in 1695, when several independent monasteries in Lebanon were collected under one religious order. The monks were divided into three categories: lay brothers, priests and hermits; all pronounced vows of poverty, chastity, obedience, and humility. In 1770, this Order was then divided into two organizations: the Lebanese Maronite Order (Baladite Order) and the Aleppine Order, renamed the Lebanese Mariamite in 1969. Saint Maron’s feast day is celebrated on February 9 in the Maronite churches around the world. This day is also an official national day in the State of Lebanon. A number of saintly followers of Maron living in Lebanon have been recognized in recent times, including Saint Charbel Makhlouf, whom Pope Paul Vl canonized in 1977; Rafqa Rayess, whom Pope John-Paul II beatified in 1985 and canonized in June 2001; and Nimutallah al-Hardini’s beatified by Pope John Paul II in 1998. 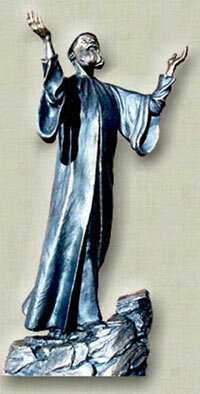 Saint Charbel (St. Sharbel; see statue of him, below), like St. Maron, is especially recognized for his ability to heal the sick, called upon to intervene numerous times since his death with reported success. In fact, this saint, who lived from 1828 to 1898, and who spent several years at the St. Maron Monastery, has impressed so many that prayers for healing now are often directed to him in place of St. Maron. 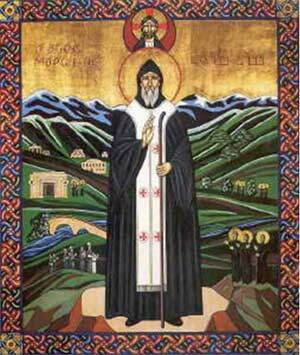 But, we should not forget St. Maron. O Holy Saint of the open sky, the light of Christ’s teachings gave you strength and perseverance to resist the adverse elements and your example now gives me inner strength to manage my weakness. Most supreme of the hermits, who like trees adorned with leaves afford comforting shade, you give me shelter and refresh me. As you stood firm as a cedar, my shakiness is settled; as you outstretched your arms like great branches, I unwind my tension; as you felt the fresh breeze against you, I open my heart to the winds of God’s love. 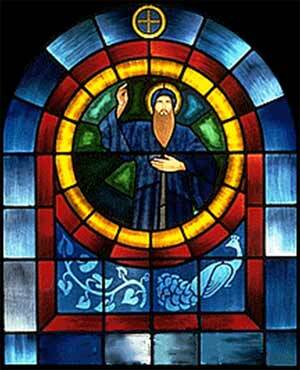 St. Maron depicted in stained glass.